Because Sony Italia does not like to host my comments below the interview, I decided, requested and obtained to take down the interview from their website. Sony Italia just published removed my interview on fotofocus.it. Here the translation for my english readers. 1. Could you please introduce yourself? Luca Sartoni, much easier finding me looking for “Luca” on Google than trying to catch me, considering that in the last 4 years I have visited 75 cities across 20 countries. My job takes me all over the world and I always carry my camera with me. 2. What do you like to photograph? I take pictures of places, but most of all people that I meet on the street. I approach them keeping a low profile and when they realize about me, it’s already too late: they are part of my picture. They I surprise my subjects again saying “thank you” for the opportunity. My typical picture portraits a single person, somewhere in the world, telling a story. I shoot digital but my final result is primary Black and White. 3. Why did you choose photography as a form of communication? I did choose photography, photography chose me. I just let that happen. 4. Who are your favorite masters of photography? Henri Cartier-Bresson, Helmun Newton, Ansel Adams, Teymur Madjederey and Eric Kim. 5. What is the pictures you would have loved to be the author? Even admiring a lot other people’s work and trying to get inspiration from master’s work I think there’s not a single picture I would have loved to be the author of. One of my favorite ever is Robert Oppenheimer’s portrait by Henri Cartier-Bresson. 6. What’s your advice to get a high quality picture? 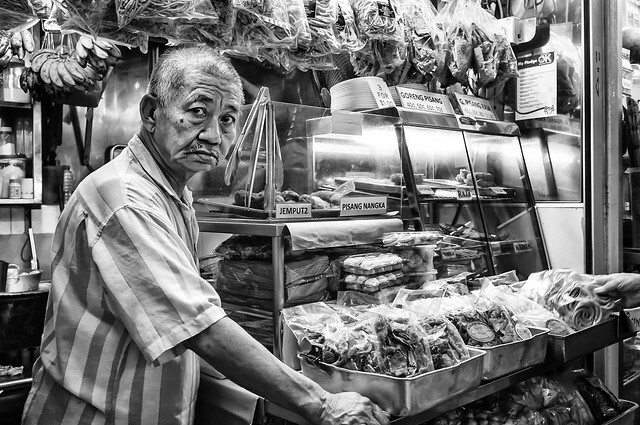 To shoot great street photographs you need to look ahead. You have to be able to see a light reflection a hundred meters away and get ready to capture the moment. Then you need to realize and accept that nine hundred ninety nine pictures out of a thousand are crap. Real crap that you need to ditch. A good street photographer can save one or two pictures per year. All the rest is training in order to get the right shot.